Does agrarian cultures still exist now - both traditional agrarian culture and modern agrarian culture? The view of cultural linearity of course answers that the age of agrarian culture has passed. Now, we have arrived at the era of industrial culture or even the information age. Alvin Toffler, twenty years ago, in the Third Wave book, blew trumpet as a sign of the death of agrarian culture - which he called First Wave of Civilization. And also other futurologists: roll out announcements of the death of agrarian culture while announcing the presence of industrial or information culture. But, we know, until now agrarian culture still survive in Indonesia. 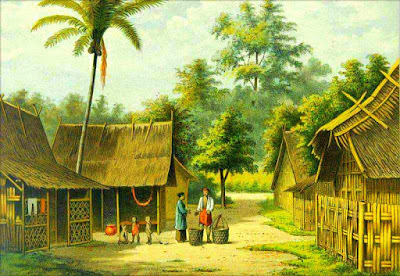 Indeed, in Javanese agrarian culture reduced due to the reduction in agricultural land and cultural or industrial information. But, look, in other places throughout Indonesia, agrarian culture still exists and has developed until now. If we look at the regions of East Java, Bali, and Sulawesi, even Papua and NTT, surely there will be a real presence of agrarian culture. This means that the emergence of a new culture does not necessarily negate other cultures: here the emergence of industrial culture or information does not automatically destroy agrarian culture. Agrarian culture, industrial culture, and information or knowledge culture turns out to form cultural clusters (nebula) - which sometimes interact and sometimes also form their own identity. This all shows, agrarian culture is not something past, but also something present now-and-here. Why does agrarian culture still exist, even develop though there are industrial and information culture - which Toffler classifies into the Second and Third Wave civilizations? First, because land (agriculture) as the main basis for the existence of agrarian culture is still functional. Althoug decreasing in various places in Java, but in various places outside of Java island, it actually increased. The opening of agricultural lands outside of Java is so significant and real and this can be the foundation or strong root of the existence of an agrarian culture; seem as water or the sea becomes the root or foundation of maritime culture. Second, the society or community that places its existence on (processing) land into agriculture still survive with a relatively significant amount. This community or society is the holder of an agrarian culture - which we then call an agricultural society. They are the determinants the death of agrarian culture because society and culture are always symbiotic-mutualistic. Third, cosmology and life institutions (both socio-cultural, social-political and spiritual) that are owned by agrarian communities still exist and protected. We know that agrarian societies are very obedient and rely on an orderly, steady, and consistent; different from industrial societies which rely on clutter. Therefore, the meaning of cosmology and life institutions is so important and central in an agrarian society. This cosmology and life institutions keep and regulate their lives as well as the existence of an agrarian culture. Fourth, the society and agrarian culture is proven to be constantly trying to transform in an effort to respond and answer the various changes that occur around it; including changes that occur due to the presence of value systems, social, and new material from industrial culture and information. One of the life institutions that is always owned by any society or community (both agrarian, industrial and informative society) is education. Its because every society always educate themselves and their communities in order to exist. Education here in the broadest sense: the effort to teach, train, guide, assist and direct the subject of students on an ongoing basis. Thus, agrarian societies also have educational institutions as an effort to educate themselves and their communities in order to exist. As one of the socio-cultural institutions, in agrarian societies and cultures, education basically and initially functioned to (i) liberate and free the agrarian community from various possibilities that made it non-human; (ii) expanding and developing humanity so that agrarian societies become fully human; (iii) empowering agrarian communities to be able to develop and sustain human life as human beings. This means, for an agrarian society, education is a fundamental instrument of liberation and humanization. Furthermore, it is also used as a basic instrument to carry out, maintain, inherit, and develop the existence of an agrarian society and culture. So, as in other societies, in society and agrarian culture education is placed as an instrument of stabilization and strengthening of existence by the function of diverting and transforming agrarian cultural values. What kind of education develops in agrarian culture and society? Or what kind of education is there in agrarian society and culture? What are the foundations of education in agrarian culture? Along with that question, what principles underlie education in agrarian societies and cultures? To be honest, these questions are not easy to answer. The reason is, first, agrarian societies generally do not concern themselves with theoretical conceptualization and so that education theory is not developed in an agrarian society; and second, agrarian culture relies on and learns about the universe, not relying on and learning from science and technology as well as industrial or information culture, so that more practice in education or life practice in the form of education. Not surprisingly, in agrarian societies and cultures, education is a practice of everyday life that is carried out with love for the survival of society and agrarian culture, not just for money. Together, the practice of education is carried out in the family and community, integrated with other life practices. In an agrarian (traditional) society, institutionalization or institutionalization of independent-autonomous educational practices [which make the -lll of education separate from other life practices] have not yet occurred or if it occurs is not so strong that in agrarian societies we only find similar educational institutions hermitage or hut the one with a simple organizational structure. Therefore, in agrarian societies and cultures, the education process is an amateur activity, not a professional activity [readable: education is an amateur activity, not a professional!] In the family and society. This is where every member of the agrarian culture community can play a role in being a teacher even though the role of the teacher can be carried by certain people. This all shows, education in an agrarian society: (a) characterized by holistic and integrative, (b) promoting praxis rather than theory, (c) being placed as amateur activities rather than professional, (d) being implemented contextually, and (e) family and community based . We know that agrarian societies prioritize the implementation of orderly and consistent rules so that agrarian culture tends to be in-ward looking rather than out-ward looking. Education in an agrarian culture is devoted to the interests of maintaining an orderly and consistent (cosmos) order, in the sense of preserving the survival of society and agrarian culture. Consequently, education in an agrarian culture consists of introductions and diversions of ethics that can maintain orderliness and consistency of rules, in addition to the introduction of farming methods that still glorify the land. Therefore, education in agrarian culture tends to be ethical and techne (vocational) rather than intellectual and competitive. Education that tends to be ethical and vocational makes the content of education loaded with ethical and vocational matters. In accordance with the main principles of education in an agrarian culture, ethical and vocational content is presented in practice, examples in the family and society directly and together. This makes the process or activity of education take place in a warm and pleasant manner while walking in an environment that is in harmony with student. This means that contextual and comfortable education can take place. Various forms of violence do not occur in agricultural community education activities. In addition, bank-style education (Freire's banking system) does not happen either. We know that agrarian culture and society are not static because there are other people and cultures around them. Cannot be rejected, changes also occur in agrarian societies and cultures. This also changes or shifts the ideals and joints of education in an agrarian society. As a result of its contact with early industrial culture, agrarian societies no longer make education solely as an instrument to maintain the viability of agrarian culture; they make education an instrument of socio-economic and cultural mobility. Education eventually became a medium to get out of the agrarian society order so that education actually deconstructed an agrarian culture rather than transforming an agrarian culture. It was here that later emerged the institutionalization of the educational process in addition to the separation of education from family and community. Its form is in the form of schooling of citizens of agrarian societies and the emergence of schools in an agrarian cultural environment. The emergence of schooling also naturally changes the principles of education in agrarian societies and cultures. The emergence of schooling also change the principles of education in agrarian societies and cultures. The principles of education adopted many principles of education in industrial society and culture. Now, society and agrarian culture are on the way to abandoning the principles of education in culture of agrarian-cultural on the one hand and on the other hand are in the process of embracing the principles of education in industrial society and culture. As reported from George Soros, Morgan, Habermas, Yasraf Amir Piliang and others, actually industrial society and culture, even information is in a crisis. The crisis of society and industrial culture also hit the main principles of education in industrial or information culture. We can read and know, so many parties have revealed various crises in the main prinsiples of education in industrial or information culture. In the 1970s, Ivan Illich said: the school had become a fetter of society so that people had to be released from school (remember: a deschooling society). In the 1970s Paulo Freire also said that education has become a practice of oppression, no longer the practice of human awareness and liberation and humanity. Roem Topatimasang, protester of IKIP Bandung, shouted loudly (like Marx's shout about religion) that schools had become opium for the people. Sindhunata, a priest as well as a prominent cultural observer, testifies dramatically that school education only produces tears. Mansoer Fakih, frontman of the NGO, firmly testified that education had experienced commodification that threatened humanity. Preire was even more assertive that school had become cunning capitalism. In line with this, Francis Wahano shouted that now there has been an acute educational capitalism that threatens the freedom and survival of all humans. Ariel Heryanto, a prominent social observer, also said that the industrialization of education had taken place along with the social changes that took place very rapidly, complicated, and complex. Dave Meier, author of the book entitled The Accelerated Learning Handbook, says that modern education and schools have been fabricated in addition to experiencing puritanization, individualization, segregation, masculinity, and linearization - which have proven to be diseases for modern humans and humanity. All this is clearly a serious signal that education and especially schools in industrial society and culture have far deviated from the original concept. Now ongoing efforts to overcome the educational crisis in industrial society and culture. It is being reconsidered whether the present principles of education in industrial culture can still be maintained or not. In addition, now also being sought alternative education principles that can be used in society and a culture of information or knowledge that is increasingly clearly defined. In the context of this effort to find alternative education principles, the principles of education in agrarian societies and cultures can contribute. The principles of education in agrarian societies and cultures that are very diverse in Indonesia are compatible with educational needs in industrial and advanced society and information. This is a contribution of local wisdom for modernity or transmodernity of life.